Geothermal energy is generated in the earth's core, about 4,000 miles below the surface. Temperatures hotter than the sun's surface are continuously produced inside the earth by the slow decay of radioactive particles, a process that happens in all rocks. The earth has a number of different layers: The core itself has two layers: a solid iron core and an outer core made of very hot melted rock, called magma. The mantle which surrounds the core and is about 1,800 miles thick. It is made up of magma and rock. 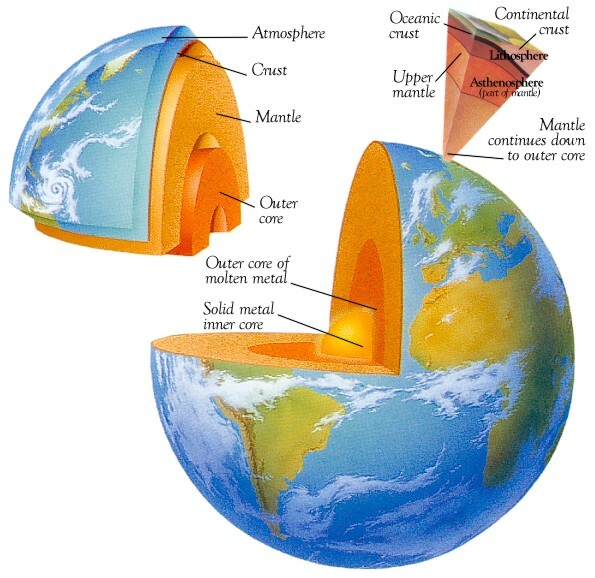 The crust is the outermost layer of the earth, the land that forms the continents and ocean floors. It can be three to five miles thick under the oceans and 15 to 35 miles thick on the continents. The earth's crust is broken into pieces called plates. Magma comes close to the earth's surface near the edges of these plates. This is where volcanoes occur. The lava that erupts from volcanoes is partly magma. Deep underground, the rocks and water absorb the heat from this magma. The temperature of the rocks and water get hotter and hotter as you go deeper underground. People around the world use geothermal energy to heat their homes and to produce electricity by digging deep wells and pumping the heated underground water or steam to the surface. Or, we can make use of the stable temperatures near the surface of the earth to heat and cool buildings. Most geothermal reservoirs are deep underground with no visible clues showing above ground. Geothermal energy can sometimes find its way to the surface in the form of: volcanoes and fumaroles (holes where volcanic gases are released) hot springs and geysers. The most active geothermal resources are usually found along major plate boundaries where earthquakes and volcanoes are concentrated. 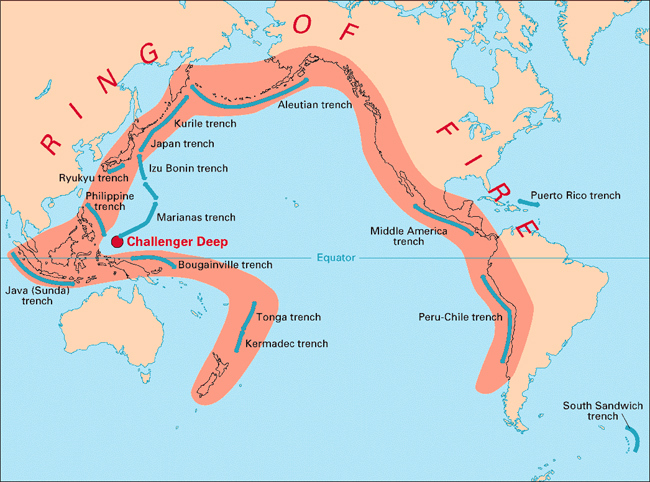 Most of the geothermal activity in the world occurs in an area called the Ring of Fire. This area rims the Pacific Ocean. When magma comes close to the surface it heats ground water found trapped in porous rock or water running along fractured rock surfaces and faults. Such hydrothermal resources have two common ingredients: water (hydro) and heat (thermal). Naturally occurring large areas of hydrothermal resources are called geothermal reservoirs. Geologists use different methods to look for geothermal reservoirs. Drilling a well and testing the temperature deep underground is the only way to be sure a geothermal reservoir really exists. 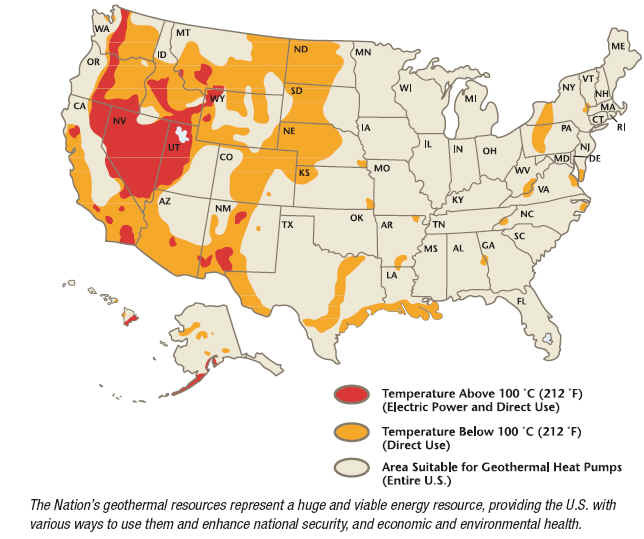 Most of the geothermal reservoirs in the United States are located in the western states, Alaska, and Hawaii. 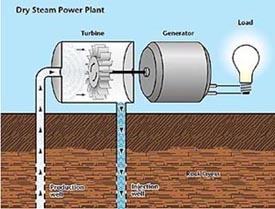 California is the state that generates the most electricity from geothermal energy. The Geysers dry steam reservoir in northern California is the largest known dry steam field in the world. The field has been producing electricity since 1960. The direct use of hot water as an energy source has been happening since ancient times. The Romans, Chinese, and Native Americans used hot mineral springs for bathing, cooking and heating. Hot water near the earth's surface can be piped directly into buildings and industries for heat. A district heating system provides heat for 95 percent of the buildings in Reykjavik, Iceland. Nevada - has 15 geothermal power plants. 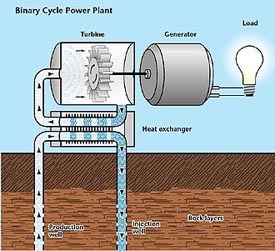 Geothermal power plants do not burn fuel to generate electricity, so their emission levels are very low. They release about 1 to 3 percent of the carbon dioxide emissions of a fossil fuel plant. 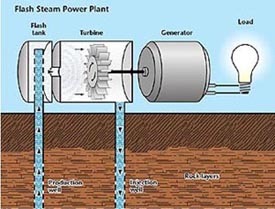 Geothermal plants use scrubber systems to clean the air of hydrogen sulfide that is naturally found in the steam and hot water. Geothermal plants emit 97 percent less acid rain - causing sulfur compounds than are emitted by fossil fuel plants. After the steam and water from a geothermal reservoir have been used, they are injected back into the earth.